Agricultural Development: Does Your Dairy Have An Emergency Plan? The unfortunate truth is that natural disasters can strike at any time. Especially in Colorado, where we experience the full extremes of all four seasons. From blizzards to floods to wildfires, Colorado’s tumultuous weather patterns can leave our dairy farms, ranches, and other properties susceptible to emergencies. Of course, there are other technical emergencies that could leave our farms vulnerable as well. That’s why it’s imperative that your dairy farm has a proper emergency response plan in place for when, not if, disaster strikes. Here at AGPROfessionals, our agricultural development experts are here to help with all of the planning, consulting, and surveying you need to make sure your agriculture property runs as efficiently as possible. From real estate to financial assistance to engineering and design support, we can help you through the entire process, whether you’re a first time farmer with an itch to break through, or a seasoned land owner looking to improve your practice. 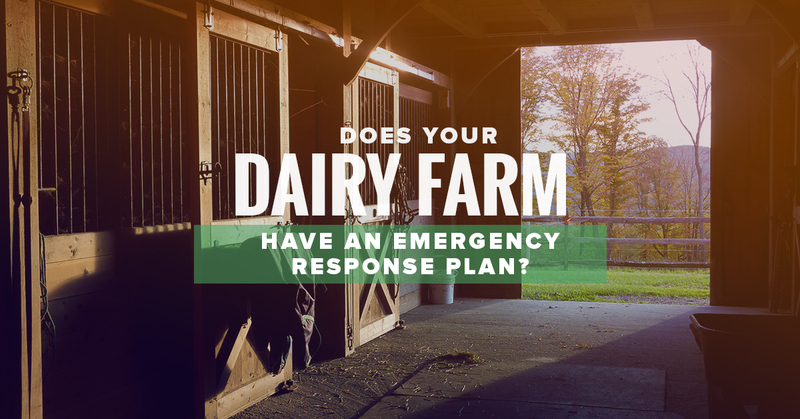 Here are some tips to help you develop an efficient emergency response plan for your dairy farm. The bottom line is, when you own or manage a dairy farm, whether commercial or as a hobby, you are fully responsible for the livelihood of the animals you care for. That especially applies to emergencies. As a dairy farm operator, you are responsible for taking logical, reasonable action in order to care for your animals in the event of an emergency. Natural Emergencies: Winter storms, floods, tornadoes, wind storms, ice storms, dust storms, and even wildfires can present severe dangers. Fire And Explosion: System failures, malfunctioning equipment, gas leaks, pipe bursts, and unexpected grass or hay fires are always risks on a dairy farm. Human Error: Whether it’s a vehicle accident, machinery mishap, or simply neglectful care, you also have to account for man-made emergencies on your farm. In the event of an emergency on your dairy farm, it’s important to prioritize the health and safety of the people on the dairy farm first and foremost. This includes family members, employees, visitors, and yourself. After that is taken care of, ensure the safety of your animals and property in whatever ways you can. This can include having an emergency contact list, backup power and fuel sources, fire extinguishers, water and food reserves, on-site veterinary aid, and a shelter or safe space (like a dairy barn) to keep your animals safe. A sure way to keep your animals safe and accounted for is to make sure they are all clearly identified, whether it’s with brands, tags, or another method. In addition to food and water reserves, both for the humans on the farm and the animals, you should also have handy a variety of tools that can assist in the event of an emergency. Key emergency supplies may include extra fence supplies, barbed wire, tarps or shade cloth, spare fuel for tractors and farm vehicles, extra tires, and readily accessible antibiotics and first-aid supplies. Another crucial step in the emergency preparedness process is to have your property surveyed to determine the best location for animal safety during a natural disaster. At AGPROfessionals, we can help with all of your agricultural development, surveying, and consulting needs that will help you and your property remain safe in any event. We will help you develop a course of action so that you can be prepared when disaster strikes. Contact the experts at AGPROfessionals today to learn more.